The Policy Framework defines the principles, scope and lifecycle for all of the University’s policies, procedures and schedules. establish clear accountabilities and delegated authorities for individual roles and groups. 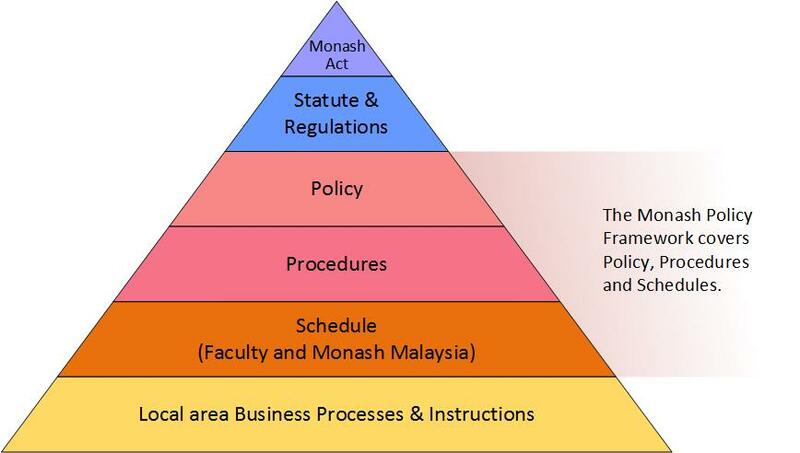 The Policy Framework fits within Monash's broader governance framework that starts with the Monash University Act. Where documents conflict in the hierarchy the highest relevant document takes precedence. There are three types of documents within the Policy Framework: policies, procedures and schedules. A policy is a concise, formal and mandatory statement of rules that outline the University’s position on governance, academic or operational matters. A procedure sets out the mandatory university-wide processes, practices or actions required to implement and comply with a policy. It specifies responsibilities for action and decision making. A schedule may be developed for implementation in response to a specific requirement within a statute, regulation, policy or procedure, or to meet an external requirement. Governance Policies that Council reserves for its own approval and for those that underpin the University’s compliance with certain legislative obligations, such as audit and risk. Academic Policies that support the integrity and delivery of quality for education, graduate research and research. Operational Policies that support the management and administration of the University.